If you want to collaborate successfully, then TU/e is the place to be. We are known for our excellent collaboration with industrial partners: we are currently the best in the world according to Times Higher Education when it comes to working with business and industry. It’s a position we cherish and one we want to extend. We have an active knowledge valorization policy, translating knowledge and research results into value for both the economy and society. Companies are essential partners in this. If you want to develop valuable and relevant technologies, you must be aligned with societal and industrial issues. By working with other (international) universities, research centers and technology institutes but also with companies. We do a lot of joint research with industry, in which our Strategic Areas, Health, Smart Mobility and Energy along with our High Tech Systems Center and Data Science Center are leading. 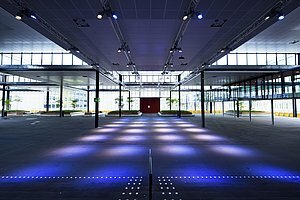 In joint research we often go that step further, developing, for example, innovation programs and R&D roadmaps with companies like ASML, Philips, DSM and Heijmans. 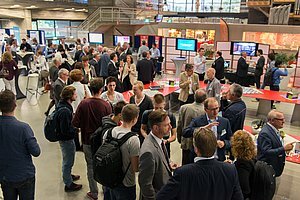 A unique form of collaboration is the Flagship in which research groups from TU/e work very closely with an industrial partner on research into relevant technologies for urgent societal issues. For instance, how to enable older people to live healthy independent lives for longer? Apart from fleshing out the fundamental research component, TU/e also takes on the role of Living Lab. This is a test environment in which new concepts are tried out, tested and evaluated in real-life situations. This generates valuable input for the research and an attractive learning environment for students. A good example of a successful Flagship is the Intelligent Lighting Institute. Since SMEs are often confronted with short-term issues, we can engage SMEs, especially suppliers, in research via large industry. It can also work the other way around: we respond to innovation issues from SMEs with the knowledge we already have or translate this into applied research.